Monday - NO WARM UP - Students presented their Facebook Projects. Then we watched the John Green, "25 Facts about Thanksgiving"
Monday - WARM UP: Students answered several review questions using Socrative then in their "Monday box" wrote down the essential question we focused on the last week. They also wrote down any questions they had. IN CLASS: Most students finished their processing activity, showed it to Mrs. Hancock or Mr. Barker, (page 8 of the Interactive Notebook) and began studying for their Quiz using Quizlet flashcards, practice tests, and games (there are MULTIPLE sets of flashcards - you choose what style you like or what you want to focus on). ATTACHED IS A STUDY GUIDE!!! 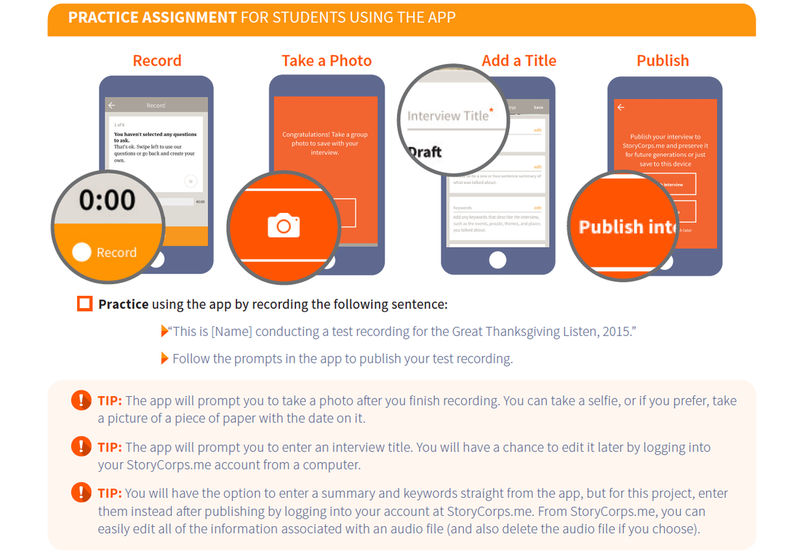 YOU MUST TAKE THE QUIZ BEFORE THANKSGIVING BREAK. Tuesday - WARM UP: Students answered the following questions using their notes 1) What were three key provisions of the Treaty of Paris? 2) How did the American Revolution influence the world? ​IN CLASS: Students reviewed the Facebook Project. AFTER students pass their Quiz (and do corrections if they want) they move onto Fakebook. Students MUST do a hard copy of Fakebook first with all of their facts. Students have a copy of the rubric and procedures in their GoogleDrive. Fakebook is due by the end of class Friday. Wednesday - WARM UP: Students connected what they're learning to current events. Students watched a video about the conflict in Syria (you may have to sign in - 1776freedom) and then completed this prompt - "Name one similarity and one difference between the American Revolution and the revolution in Syria." Here is an extra article IF you want to learn more - you don't need too. There is some upsetting content is this article. IN CLASS: Students reviewed the Facebook Project. 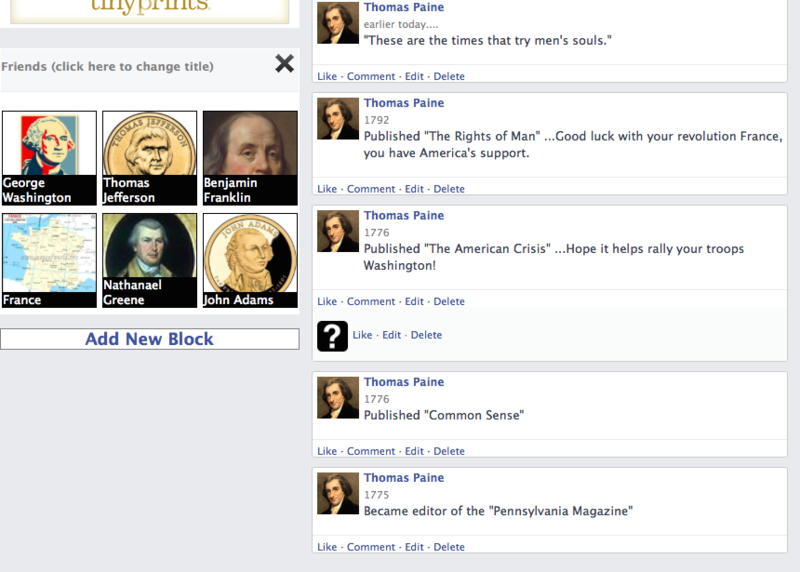 AFTER students pass their Quiz (and do corrections if they want) they move onto Fakebook. Students MUST do a hard copy of Fakebook first with all of their facts. Fakebook is due by the end of class Friday. Thursday - WARM UP: Students answered the question, "Who do you think was most influential leading up to or during the American Revolution? Why?" IN CLASS: Students reviewed the Facebook Project. AFTER students pass their Quiz (and do corrections if they want) they move onto Fakebook. Students MUST do a hard copy of Fakebook first with all of their facts. Students have a copy of the rubric and procedures in their GoogleDrive. Fakebook is due by the end of class Friday. Friday: WARM UP: Students answered the question, "What challenges do you think the United States will have after the American Revolution? Why?" IN CLASS: Students completed their Fakebook Project. We are presenting in class on Monday!! If you are not going to be here you need to have me review it/grade it today :) TURN IN YOUR WARM UP! THESE ARE THE LAST GRADES OF THE TRIMESTER. Go here to create your Fakebook page AFTER you complete notes and do your rough draft. Notice the images, a linked video, and biographical information. Do your research first THEN log on to the Facebook page to create your digital project. 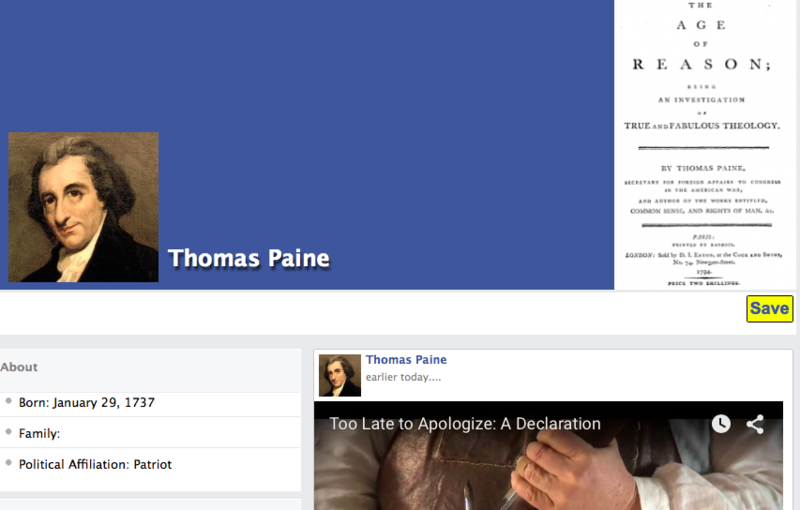 Notice the "Friends" we included for Thomas Paine! Think historically :) Also notice the quotes on his "Wall". These are quotes from documents he published, and we are including events that actually happened at the time! Monday - WARM UP: Reflect on Friday's activity. 8B voted against independence. What is one positive and one challenge of that decision? IN CLASS: Students listened to the preamble of the Declaration of Independence on "Flocabulary" and filled in the missing vocab on this handout. Then with table teammates they skimmed the Declaration of Independence (DOI) which can be found on pages 146 - 149 in the textbook. We discussed the main ideas of each section as a class. Finally students were assigned one part of the DOI that they had to match to "modern language" - use this handout. We will finish reviewing this in class Tuesday. Tuesday - WARM UP: Write a 4 - 8 sentence summary of the Declaration of Independence. IN CLASS: Students reviewed the excerpts of the DOI and what they matched to as far as "modern language" then students started to examine HOW the Americans were going to protect their rights... through the American Revolution. In their Interactive Notebooks students completed the Preview and notes for Sections 2 and 3. **If students were absent on Monday they will want to review this handout that discusses the game they played in HE/gym relating to the American Revolution. WANT TO LEARN MORE: Check out "Lost treasures of the Founding Fathers" or "Bet you didn't know: American Revolution"
Wednesday - WARM UP: Students watched a clip of "the Battle at Bunker Hill" and answered the question "What is the outcome and effect at Bunker Hill?". IN CLASS: Students worked in their groups on sections 4 and 5. Thursday - WARM UP: Students watched a clip relating to "the Battle at Trenton" and answer the question, "What was Washington's strategy for attacking the British at Trenton? What was the outcome?". IN CLASS: Students worked in their groups on sections 6 and 7. WANT TO LEARN MORE: Check out these videos about the Battle of Princeton, the Battle of Saratoga, and the Winter at Valley Forge. Friday - WARM UP: Students watched a video clip about "Washington at Yorktown" and answer the question, "Why did the Americans win this battle?" IN CLASS: Students worked in their groups on sections 8 and the Processing Activity. Quiz next Tuesday. 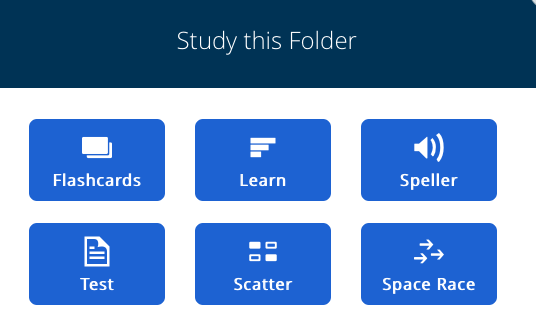 WANT TO LEARN MORE: Check out the video "Global Impact of the American Revolution"
**They have a FREE app you can download on smart devices OR go to this link to play review games or use flashcards! Monday - WARM UP: What role do you want to have on Friday for the final simulation? Patriot (Whig), Loyalist (Tory), or Moderate? What colony? ... Then in class, students completed notes. After that students began working on their timeline of events relating to the colonies and events leading up to the revolution. Tuesday: WARM UP: What stands out to you in the song, "This Ain't Working"? What questions do you have? Attached are the lyrics. Then in class, students worked on their timeline. Wednesday - WARM UP: Read page 1025 in the textbook and answer the "Practice Questions" # 1 - about timelines. Friday: DEBATE!!!! Students will be taking on the issue "should the colonies declare independence?" Here is the schedule. Monday - WARM UP: Reflect on the activity answering the attached questions. If you were not in class write how you think you WOULD have felt. In class we reviewed Chapter 5 Section 1 that students completed with the substitute. Students were assigned their "role" for the week. Tuesday - WARM UP: Watch the video about colonists protesting British policies. How and why did they protest? In class we created a graphic organizer to help remember key idea such as the Intolerable Acts. Then students worked with their group to prepare for Town Hall Meeting 1. Here are the notes for the week and the directions for the simulation as well as the role cards incase you want to read about other Patriots, Loyalists and Neutralists. Wednesday - WARM UP: Watch the video about the Sons of Liberty and the Boston Tea Party - Why did this happen? In class students worked with their group to prepare for Town Hall Meeting 2. Thursday - WARM UP: Read this source and answer the question in the slide. In class students worked with their group to prepare for Town Hall Meeting 3 and Meeting 4. 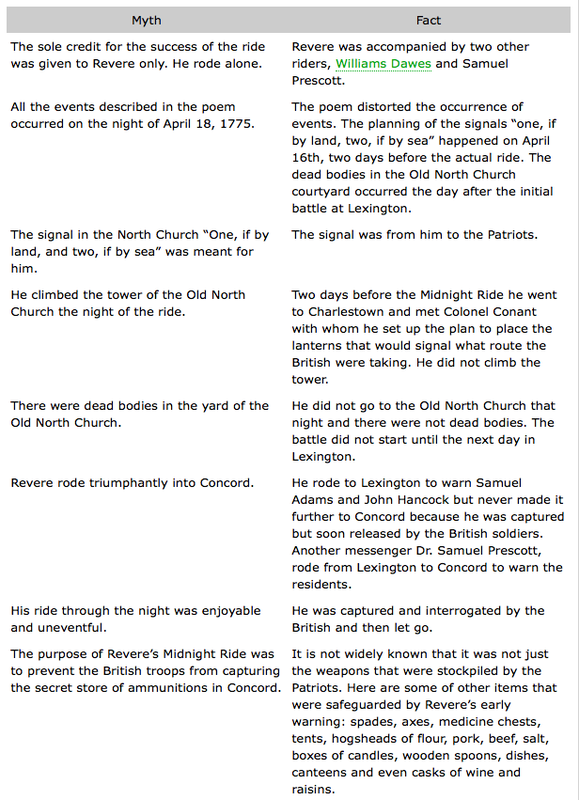 Here is a reading on Lexington and Concord. Friday - WARM UP: Watch this video about the "shot heard round the world". Why do you think this event got that nick name? Students are on a shortened schedule due to the Halloween Fashion Show. In class, students completed a processing activity to reflect on their week. Students may also work on a Close Analytical Read of Patrick Henry's Speech, "Give Me Liberty or Give Me Death." If we don't complete this we will work on it next week. Monday and Tuesday - students completed a timeline of events relating to Exploration, Colonialism, and pre-Revolution.